The lungs (or pulmonary system) are a pair of organs located in the chest (on either side of the heart) that perform respiration – the transporting of oxygen from the atmosphere into the bloodstream and releasing carbon dioxide (a waste gas) out of the bloodstream into the atmosphere. The lungs will eliminate approximately two pounds of waste (in the form of carbon dioxide) each and every day if functioning properly. Your lungs have a vital job. Each day you take about 23,000 breaths, which bring almost 10,000 quarts of air into your lungs. The trachea divides into the two main bronchi that enter the roots of the lungs. These breathing tubes continue to divide into smaller and smaller tubes called bronchioles. The bronchial tree continues branching until ends in tiny air sacs called alveoli. Alveolar sacs are made up of clusters of alveoli, like individual grapes within a bunch. The individual alveoli are tightly wrapped in blood vessels and it is here that gas exchange actually occurs. De-oxygenated blood from the heart is pumped through the pulmonary artery to the lungs, where oxygen diffuses into blood and is exchanged for carbon dioxide in the hemoglobin. This oxygen-rich blood returns to the heart via the pulmonary veins to be pumped back into the bloodstream. The lungs are covered by a protective membrane called the pulmonary pleura. Infections due to the moist nature of the lungs, which makes it hospitable for bacteria. The diaphragm, located below the lungs, is the major muscle of respiration. It is a large, dome-shaped muscle that contracts rhythmically and continually, and most of the time, involuntarily. When inhaling, the diaphragm contracts and flattens and the chest cavity enlarges. This contraction creates a vacuum, which pulls air into the lungs. 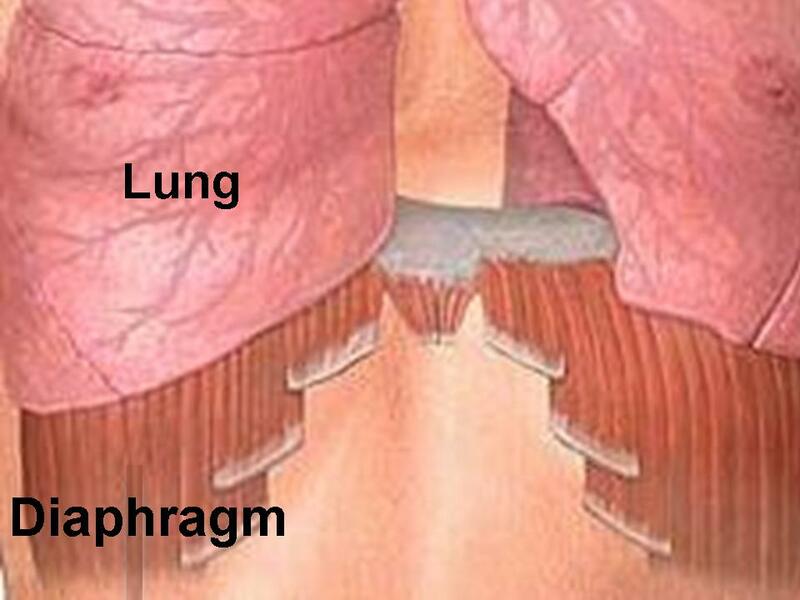 When exhaling, the diaphragm relaxes and returns to its dome like shape, and air is forced out of the lungs. 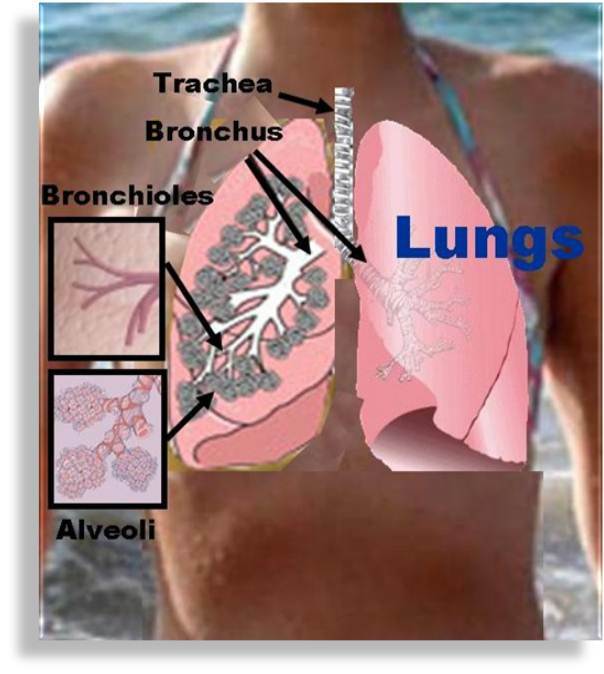 How do the lungs protect themselves? The nose acts as a filter when breathing in, preventing large particles of pollutants from entering the lungs. Particles that make it past the nose will get stuck in a thin layer of mucus that lines the inside of the breathing tubes. An average of 3 ounces of mucus is secreted onto the lining of these breathing tubes every day. 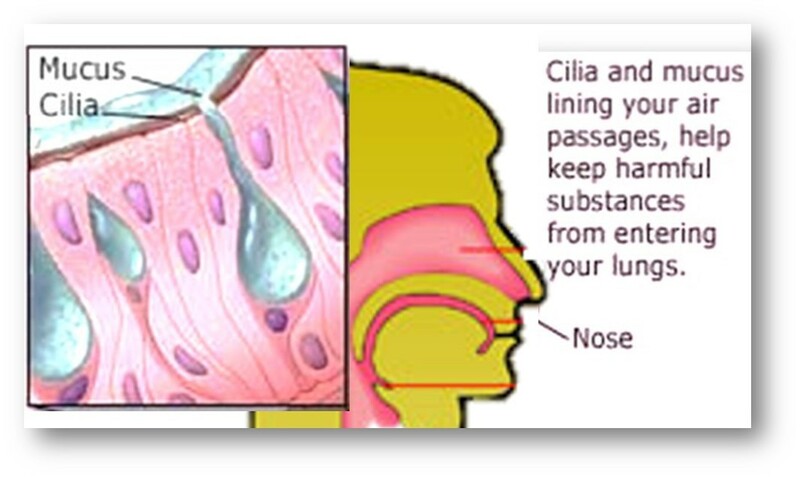 This mucus is “swept up” toward the mouth by little hairs called cilia that line the breathing tubes. A cough is another protective mechanism and is the result of irritation to the bronchial tubes. A cough can expel mucus from the lungs faster than cilia. When the lungs are irritated, muscle bands which surround the lungs can tighten, making the breathing tube narrower as the lungs try to keep the irritant out. The rapid tightening of these muscles is called broncho-spasm.